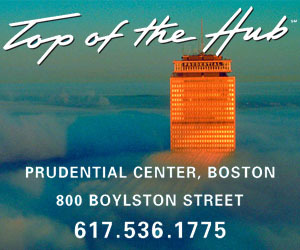 There is nothing like sitting 52 stories above Boston for dining and a spectacular view of the city. The magnificent cuisine complements the breathtaking views. Live jazz seven nights a week: Sun & Mon from 8 p.m.- midnight, Tue-Thu from 8:30 p.m.-12:30 a.m., Fri & Sat from 9 p.m.-1 a.m.